Nissan Micra Performance, Engine, Ride, Handling | What Car? The range starts with a non-turbocharged 1.0-litre petrol engine (IG 71) that isn’t remotely fast and we reckon the 99bhp 1.0-litre (IG-T 100) is well worth its price premium. It zips the Micra along quite happily and provides all the performance you need for town driving and relatively comfortable motorway use. It’s also the only engine available with an automatic gearbox, but bear in mind that opting for one increases the 0-62mph time by more than two seconds. Those who need a little more power can choose the 115bhp DIG-T 117 version of the same 1.0-litre turbocharged engine. It still feels pretty flat from low revs, but feels more responsive once it gets going and makes motorway progress less of an effort. The difference between it and less powerful engine feel relatively slight, though, and it comes with a firmer, less comfortable suspension set up. Factor in higher purchase and running costs, and we’d stick with the IG-T 100. For those who prefer diesel power, the 1.5-litre engine (dCi 90) delivers its power evenly from low revs. True, it doesn’t like to be taken all the way up to its redline, but that’s a trait common to most diesel engines of this size. The Micra’s suspension is fairly stiffly sprung which prevents the car from bouncing around over undulating roads. However, the Ford Fiesta, Skoda Fabia and Volkswagen Polo all have a smoother ride. Its firmness is particularly noticeable around town, where the Micra fidgets more and has a tendency to crash over the kind of sharp potholes that rivals would take in their stride. Much of the Micra's jitteriness smoothes out once the speed rises, though, so it’s a comfortable motorway cruiser. Opt for the DIG-T 117 petrol engine, though, and you get a stiffer suspension set up that, as you’d imagine, is less adept at soaking up bumps. 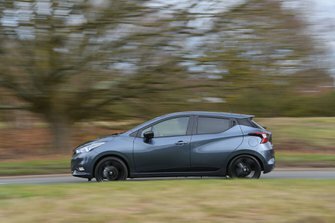 Light steering makes the Micra undemanding in town, but the wheel doesn’t weight up with the consistency that you get in a Ford Fiesta or Renault Clio out on the open road and you you can’t place the car as intuitively as you’d like. 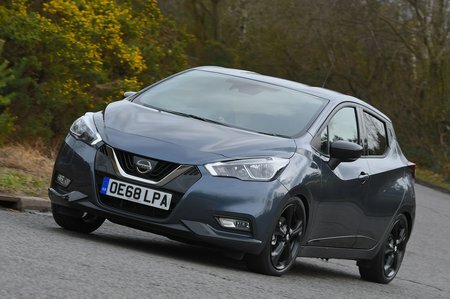 As Nissan is loudly trumpeting the latest Micra’s sportier bent, this is a little disappointing, but at least body lean is well controlled and there’s plenty of grip in dry conditions. The rear end gets a little twitchy on wet roads, though. 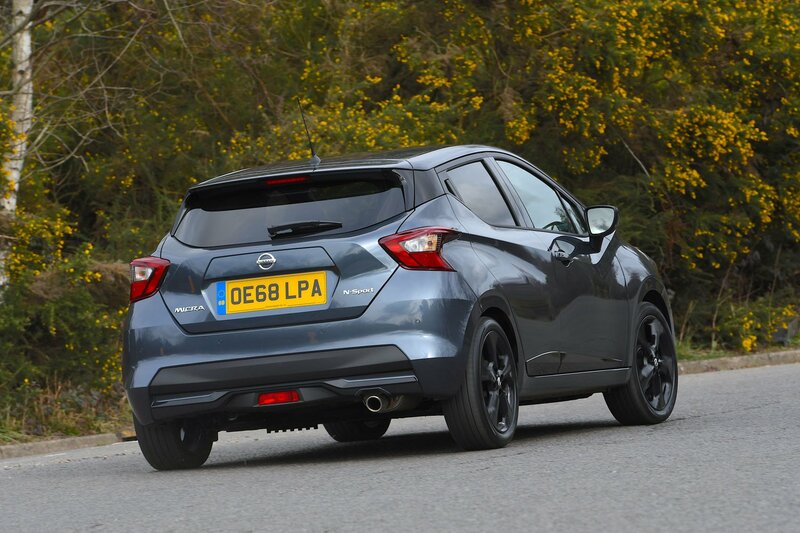 Cars with the DIG-T 117 engine come closest to fulfilling Nissan’s sporty claims, with quicker steering and a lower, firmer suspension set up that does help it to stay flatter in fast corners. However, under more restrained driving conditions, it’s something you’ll struggle to notice, save for the slightly richer steering feel. The IG 71 engine has to be worked hard and is noisy as a result. The more powerful turbocharged versions also get quite vocal at higher revs but, thanks to their greater low-down grunt, you have less need to rev so hard. And even then, the accompanying thrum is far from unpleasant. No qualifying statements are required for dCi 90 diesel. It is one of the smoothest engines of its type, particularly when compared with the Skoda Fabia’s diesel. Sadly, the Micra’s vague-feeling gearbox isn’t as impressive, but the clutch is fairly light and positive and the brakes progressive so you can drive the Micra smoothly in snarled-up city traffic. A five-speed manual is standard on all but the DIG-T 117, which six speeds. An automatic gearbox is available with the IG-T 100 and, while not the smoothest example of an auto, it’s slick and unflustered around town. We’d still stick with the manual, though.